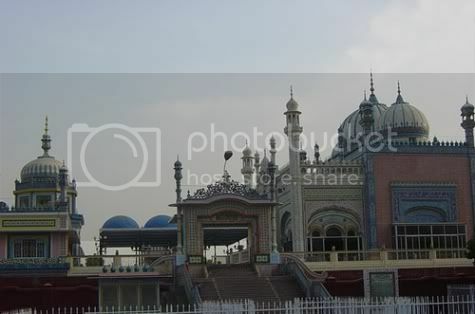 Pakistan has numerous mosques which are envy of the world because of their architecture as well as detailed decoration. This is our second post in the series of highlighting such grand mosque architecture in Pakistan. 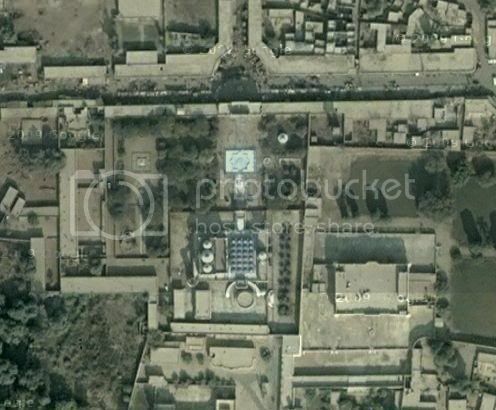 Our first post of this series was about masjid Mahabat Khan in Peshawar. Today’s post is about the fomous Bhong Mosque located in a town called Bhong. Bhong mosque is famous for its architecture as well as the decoration done here. 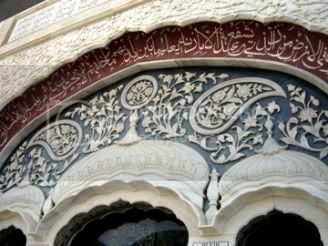 The extensive calligraphy done of verses from Quran here makes it one of a kind place in Pakistan. There are pictures of Islam’s holiest places framed in real gold. The roof of the complex glitters with the extensive mirror work done on it. 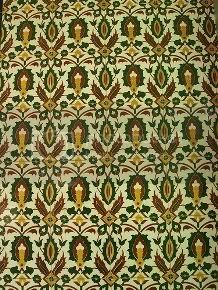 It is said that every square meter of this mosque has some decoration or design made on it. 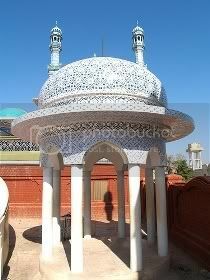 This mosque is a living catalog of decorative techniques for public buildings either invented or practised in both Pakistan and India. The architecture of the mosque and decorative patterns are mostly local. One major exception is a gateway which takes its design from a similar gateway in Baghdad. 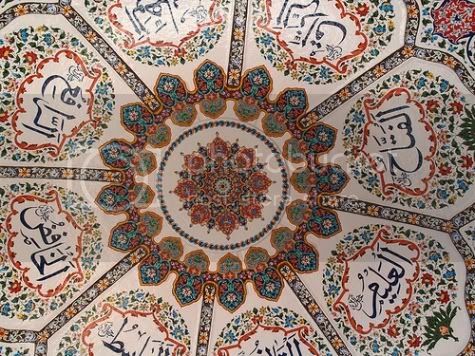 Following photo is a sample of intricate roof work done at Bhong Mosque. 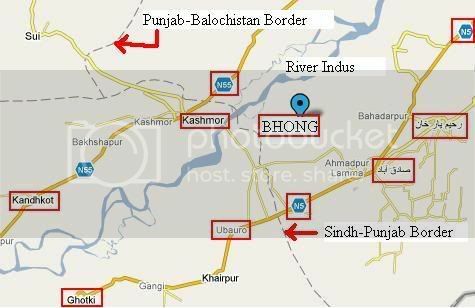 Bhong is located 35+ kilometers west of Southern Punjab city of Sadiqabad (pop 180000) and 50+ kilometers west of Rahimyar Khan. Sadiqbad itself is located on National Highway N5 and it is the largest city in Sindh-Punjab border area. From Sadiqabad, take Sadiqabad-Kashmore road upto a small town called Ahmadpur Lamma. From there a road goes westward to Bhong. The map below shows Bhong’s location as compared to other major towns and highways in the vicintiy. 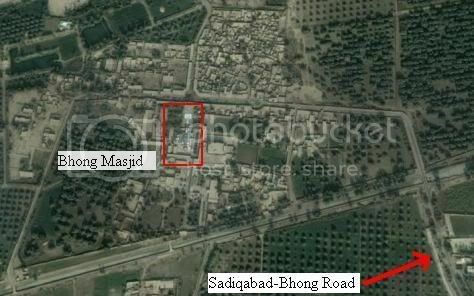 Following satellite image shows location of the Bhong masjid complex as well as the road connecting it to Sadiqabad. Following satellite image is a further zoom-in on the Bhong complex. It is said that town of Bhong and the mosque were built by a local landlord named Rais Ghazi Muhammad Indhar. The construction on the Bhong mosque continued contniuously from 1932 to 1982. It is said that the landlord built this mosque because of a dream he had and he believed that he will die if he ever stopped construction on the mosque (unconfirmed). It is also said that he died within a week after construction was stopped on the mosque in 1982 (unconfirmed again!). However, what is confirmed is 50 years of construction on this mosque as well as the immense generosity Rais Ghazi Muhammad Indhar had shown in sponsoring a project this gradiose for half a century. Rais Ghazi Muhammad Indhar’s family claims direct descendence from Bahawalpur’s Abbassi family. Sons and grandsons of Rais Ghazi Muhammad Indhar still look after the mosque. They also form a strong political influence in Sadiqabad – Rahimyar Khan area with atleast two grandsons of Rais Ghazi Muhammad Indhar who have/had been elected MPs and Ministers. It is also said that during 50 years of continuous construction on Bhong mosque, 1000 artisans were employed. These were the best men of their trade in both Pakistan and India. Every surface of Bhong Mosque is aglow and vibrant. 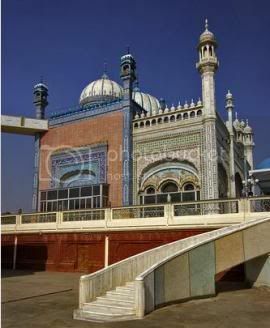 Tiles are widely used in the complex, not just the heavenly blues that speak of Multan, but other colors alongside, often used to create a patchwork effect. Some frescoes have traditional designs and others jolly baskets of roses that look like scraps from a Victorian album, writ large. Even the glass is all painted or stained and the light shines through in a myraid of colors. There are exquisite inlays in wood and mother-of-pearl. White marble is carved with intricate designs and onyx is also much in evidence. 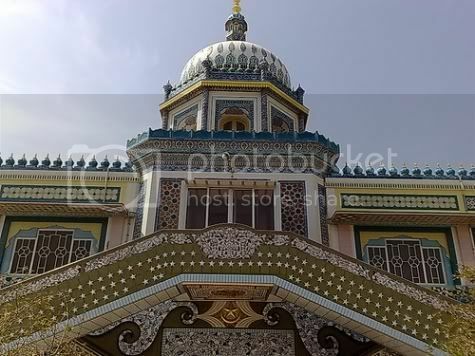 It (the decoration on the mosque) does have the feeling of something done with great love and devotion, and with noble motive of teaching traditional skills. It is a sermon in stone, a hymn to the tastes of the common man in the rickshaw, the very best of the popular art of the subcontinent combined in one building. For the benefit of toursits, there is also an information plaque in English at Bhong Mosque. I would like to pick following excerpt from that plaque. Formally the mosque reflects the traditional regional style with its 3 ribbed domes and 8 minarets at the corners and the entrance. 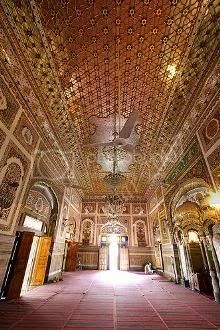 In addition Rais Ghazi borrowed the stylistic elements from mounments in Lahore, Iran, Spain and Turkey. He mixed these with the Western Colonial elements on 1940s which appear in the guest houses and market. To create this blended form of architecture, artisans were brought to Bhong from several places in Pakistan. It is said that most of the master masons and craftsmen came from Rajastan while calligraphers and painters from Karachi. There are two prayer halls in the masjid comples. One is for men and another one for women. 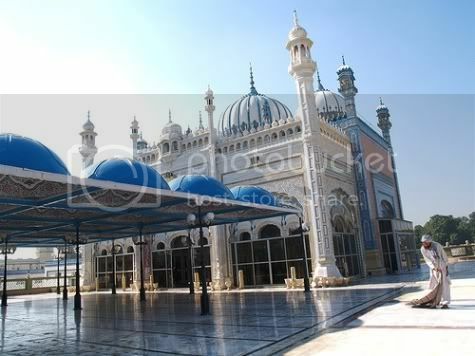 These prayer halls and a library are all built on top of a 3m high platform. The platform itself contains store rooms and workers quarters. An ablution pool and guest accommodations are found at an intermediate level, where as student boarding rooms are located at the lower level. Materials and crafts used range from the traditional (teak, ivory, marble, coloured glass, onyx, glazed tile work, fresco, mirror work, gilded tracery, ceramic, calligraphic work and inlay) to the modern and synthetic (marblized industrial tile, artificial stone facing, terrazzo, coloured cement tile and wrought iron). 1. Bhong Mosque won the Aga Khan Award for architecture in 1986. 2. Rais Ghazi Muhammad Indhar, the sponsor and builder of Bhong Mosque was posthumously confered with ‘sitara-e-imtiaz’ by the President of Pakistan on March 23, 2004. 3. Government of Pakistan issued a postal stamp with Bhong Mosque on its face on May 12, 2004. 4. Public school arrived in Bhong in 1960s. Until then the mosque was also the only center of education for area children. 5. The Aga Khan architecture award plaque on the mosque recognizes following aritsans who worked on the mosque: Haji Rahim Bukhsh, Mistri Faiz Mohammad, Allah Diwaya, Nabi Bukhsh, Hafiz Anwar, Faiz Bukhsh, Wahid Bukhsh, Rahim Bukhsh, Sysd Shah Ghulam Mahmood, Abdul Ghani, Allah Bukhsh and Ahmad Bukhsh. Imran, tell us about how did you reach Bhong. Did you take the road from to Bhong from National Highway (N5) or else? This was the first thing that came in my mind when I steeped out of my car yesterday in the town of Bhong. 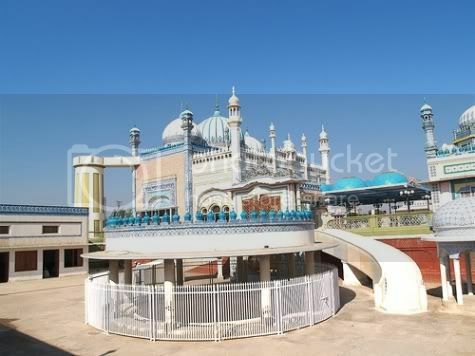 This mosque is beatutiful and worth seeing, like countless other places in Pakistan. One thing that always disturbes me is the Govermnet’s attitude and seriousness about it. Mosque construction started in 1932 and substantional completion was in 1982. It took 50 years to complete it and wow…… the time paid off. There hasn’t been a single day when no repaid or construction work is in progress since its construction started in 1932. Construction is a mix of all Muslim designs that have been adopted over time for mosques in thier empires. Some work has been done with paint brush on walls and wood….. and belive me you cannot spot this with first look…. 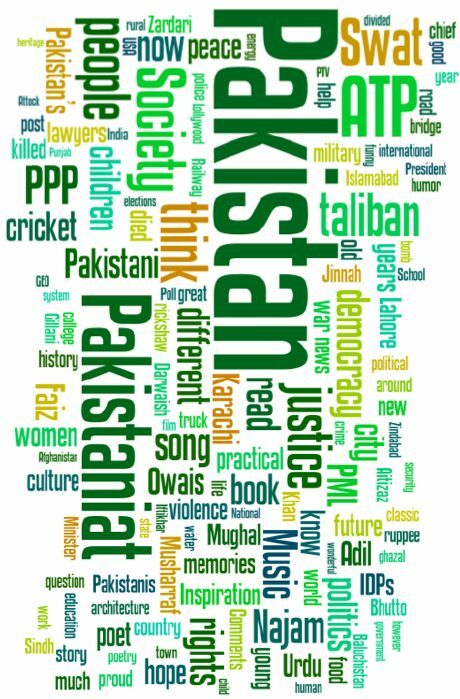 Request you all readers to promote the heritage and culture of Pakistan to entire world and tell every one proudly that this is all we have………. we are the best in every thing…. and if some one has the other ideas…… come see us !!!!!!!!!!!! !